Henry Pyefinch (c. 1739-1790) was an English maker of optical instruments, having been apprenticed to Francis Watkins in 1753 to learn the trade. Along with several other instrument makers, Pyefinch was sued by Peter Dollond (1706-1761) for having infringed on his patent for achromatic telescopesand Dollond won. The patent ran out in 1772 and Pyefinch was free to advertise and make instruments with so-called achromatic lenses. This instrument is a compound monocular microscope modeled after John Cuff's design. It is mounted on a square wood base measuring 17x17x6cm, with a drawer for accessories. The support pillar is mounted with a compass joint so that the instrument can be inclined. For specimen focus, it has a Hevelius fine adjustment attached to the stage. 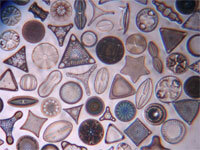 The microscope body is engraved with numbers corresponding to each of the six objectives. The stage is a Bonanni-type spring stage. The mirror housing is a modern replacement, but the mirror itself is believed to be 18th century. The microscope is signed on the stage, "H. Pyefinch, Cornhill, London," but it is not dated. It was probably made around 1780. The total height of the instrument is 43cm. 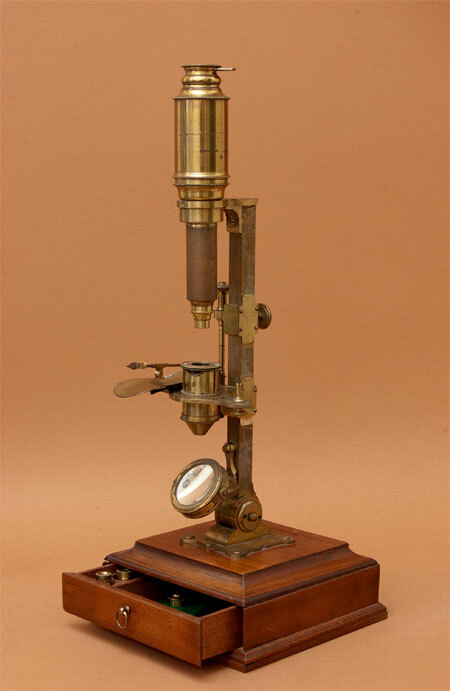 The optics of this microscope have been characterized by students at UC Berkeley. Optically, this microscope exhibits chromatic and spherical aberration, however images are adequate to very good, with higher magnification yielding the best image.